Anbkor Wat was erected in the early 12th century–when Gothic architecture was created. The last series of posts explored the birth of Gothic style, and the final part boasted that no other culture enclosed large spaces with walls almost entirely made from glass. True, but the people who built Angkor Wat had their own cultural patterns. The Khmers couldn’t make stained glass windows, but they didn’t need to. They had a different way of seeing reality. The sun is more powerful at Angkor Wat’s tropical latitude than it is around Paris, where Gothic style was born. What you feel from it is not a pale light that reflects images, but an overpowering energy that envelops you. The tropical sun makes Angkor Wat and the other Khmer momuments seem to radiate the power that the universe came from. And it sparkles on the canals, moats and reservoirs that lace Angkor. Nature and sacred architecture shine more brilliantly than they usually do in Northern Europe. And a lot more shined. Archeologists have found that Angkor’s settlement patterns were lined along the canals, and that open fields spread between clusters of homes and shrines. Angkor thus wasn’t one congested mass, like modern Bangkok, or the dense jumbles of homes in medieval European cities. Imagine how the green fields, limpid canals and glorious temples sparkled under the ebullient sun–no need for Gothic stained glass windows in Angkor. The Chinese businessman Zhou Daguan, who lived in Angkor in 1296-7, said that Khmers bathed several times a day. Every group of 2 or 3 families owned a bathing pond. We can imagine them taking a break from the heat, teasing and splashing each other, wrestling, singing and flirting. Folks perfumed themselves with sandalwood and musk. Angkor was cleaner than medieval European cities were. So, the Khmers created as much beauty as the builders of Gothic cathedrals did, and both flourished at the same time. 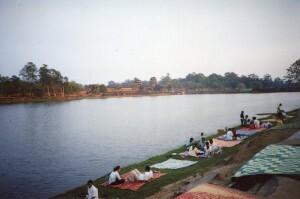 Cambodians still enjoy relaxing by the water. Linger around Angkor Wat for a while, and you’ll be transported back to the days when it was built.